A Turkish court sanctioned the indictment of a 16-year-old high school student after a critical speech directed against President Recep Erdogan’s government, local media reported. The student, identified by the initials M.E.A. for legal reasons, is a member of an online group called Democrat High School Students, according to a report in the Hurriyet newspaper. On Tuesday, he attended a ceremony to commemorate Mustafa Fehmi Kubilay, a Turkish military officer, who was killed and beheaded in 1930 by pro-Sharia rioters standing against the secular government. Kubilay is considered a revered figure in the historic turning of Turkey into a secular republic by Mustafa Ataturk. At the gathering he reportedly delivered a scalding speech accusing Erdogan and his government of corruption. The next day police detained M.E.A. at his school in the city of Konya and took him to a police station for an interview. A public prosecutor then sought the indictment of the teen, which was granted by the city’s 1st criminal court. The teen reportedly pleaded not guilty to the accusations. The newspaper says the student is facing up to four years in prison for violating article 299 of the Turkish criminal code. The article deals with denigrating speech against ‘Turkishness’, the Turkish government, legislature and military. It provides a maximum term of three years for insulting ‘Turkishness’, the republic itself or the national parliament, although a longer term is possible for a Turkish citizen committing the offence in a foreign country. However, the code also explicitly states that criticism voiced as an exercise of the right for free speech cannot be considered a crime. M.E.A.’s lawyer Baris Ispir said they would appeal the court’s ruling. “Our friend in question made remarks which are freely shared on Facebook, Twitter or other social media in his statement,” Ispir said. He added that the criminal prosecution against the activist was an act of oppression. 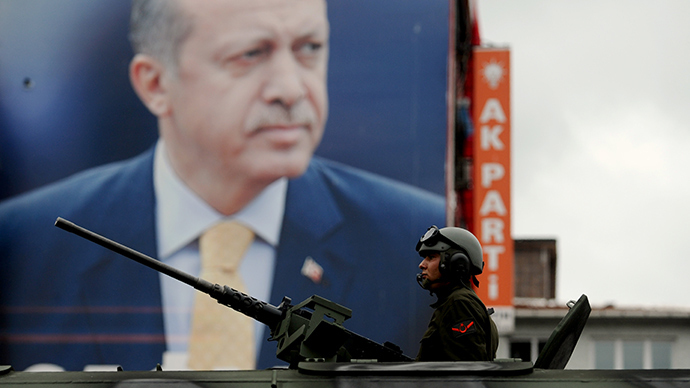 Erdogan’s government recently launched a crackdown on the media, arresting more than 20 people. Turkish officials said it was a rightful act in stopping a mudslinging campaign by supporters of the US-based Muslim cleric Fethullah Gulen. Erdogan and Gulen, former allies, have been engaged in a cutthroat political struggle. Last year Erdogan, who was Turkish prime minister at the time, had to sack four ministers amid mass protest over accusations of corruption in the government.